At Carnoisseur we offer a huge range of driving shoes, from stylish moccasins and brogues, through to FIA approved racing boots and casual trainers that provide optimum driving comfort. We keep UK stock of our driving shoes and offer fast delivery with free returns. 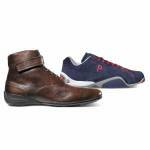 Currently we're even offering free Heel Tread socks with all Piloti driving shoes! If you're looking for driving shoes you have come to the right place; take a look at our shoes online and feel free to call us for expert advice if you have any questions. Want to find out more about Driving Shoes? Check out our Driving Shoes Buying Guide. Do you wear socks with driving shoes? It really depends on the type of driving shoe you are referring to. For a lot of people a "driving shoe" is the classic driving moccasin. These can of course be worn with socks, but they are more often a Summer shoe worn with shorts or chinos, in which case we would suggest you leave the socks at home. For other driving shoes including driving boots, FIA Approved racing boots and casual driving trainers we would recommend wearing socks for increased comfort and a better overall look. Should driving shoes be a tight fit? Driving shoes are typically a narrow shoe. This is because they are designed for increased pedal-feel and control. In sports cars, especially classic cars, the pedals can be close together and you don't want a shoe that's going to make it harder for your feet to locate the pedal you are looking for. Our range of Piloti shoes are quite narrow, although we do find that they wear-in and become comfortable for the majority of foot shapes over a short space of time. We recommend going a half size larger than you would normally for some Piloti shoe styles - please see the product listings for details or contact us for more information. It really depends on exactly what you are using them for. For racing and karting you will need a racing boot, and depending on the event you are competing in, these may have to be FIA approved. These will have a thin sole and a high cut design. They help achieve optimum comfort and pedal-feel whilst driving but you wouldn't want to walk around in them all day. For day-to-day use we can offer driving shoes that range from a casual trainer through to a smart brogue or moccasin. These shoes allow for enhanced driving comfort and control, whilst also been extremely comfortable walking around town or on an evening out. A driving shoe is a shoe or boot that's designed to increase driving comfort and pedal control. They typically have a curved heel and a slightly narrow fit. Driving shoes include a wide range of styles from FIA Approved racing boots through to stylish moccasins and casual trainers.